Yawn! 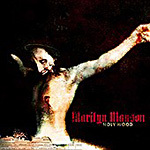 "Holy Wood", Manson's fourth album, is possibly going to be his last, and it's about time. While "Portrait of an American Family" did show a lot of potential at the time, the development of the Manson character was never very good and, while Brian Warner did have some things to say, they pretty much got lost in the screaming match that constituted Manson's music and the reaction to it. Where "Mechanical Animals" was eclectic, smart, ironic and sometimes fun, "Holy Wood" is, visually and musically, a return to the noisy, clich�d and largely uninteresting sounds of "Antichrist Superstar". Manson screams, yells and whines his way through a seemingly unending 20 tracks of powerchords and industrial beats. The main topic is, again, but he targets the fundamentalist right more than he did before, thus losing all relevance to the average person. 'Cruci-fiction in space' is a classic example - the supposedly controversial hook is evolution, which is only controversial if you live in Deep South USA. Baiting such an easy target as US fundamentalists takes no effort and holds no interest. Maybe having heard bands like Christian Death do this a lot better years ago has made me jaded and the "kids" will love this, but musically and conceptually, this is just an empty vessel that makes a lot of noise.